The benefit included pas de deux from Jerome Robbins’ classic short ballet Interplay, performed by Colburn Dance Academy students Anatalia Hardov and Jackson Bradshaw. Millepied calls the academy “essentially the school of the LA Dance Project,” and says he has seen the school produce a myriad of talented young dancers. Millepied himself choreographed the company’s performance Hearts and Arrows, set to Philip Glass’ String Quartet No. 3. The chemistry of this nine-person performance is astounding—the dancers move in a way that explores the precariousness of the position between safety and peril in group dynamics. Former New York City Ballet principal Janie Taylor gave a magnificent performance with Millepied set to Sonnet 43, Sonnet 20, and Zubulon by Rufus Wainwright. Millepied is correct: the classical forms and elements in these performances are clear, but I am left envious that my own rigid ballet training did not include the freedom and fluidity that the LA Dance Project so stunningly executes. Millepied—a former New York City Ballet principal dancer—launched the group in 2012. Shortly after, he took on the esteemed artistic director role at the Paris Opera Ballet, where he just completed his first full year while maintaining involvement with the LA Dance Project. A diverse range of choreography is what makes LA Dance Project unique in the dance world, and he says it is “entirely intentional” that his modern choreography be viewed alongside classic American choreography like that of Robbins. 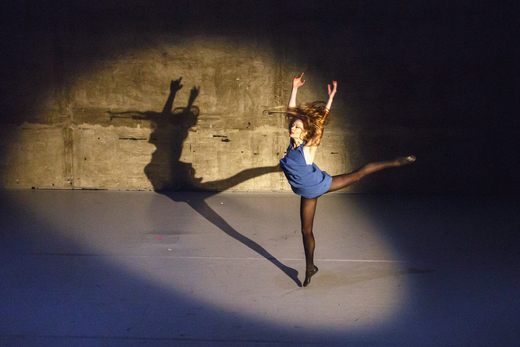 The classical/modern divide is not the only barrier the LA Dance Project is breaking down. While their studios are housed in the Los Angeles Theatre Center downtown, performances are often given in more unconventional, non-theatre locations, like the ACE Hotel and Union Station. Everything is a collaboration: Janie Taylor designed the costumes for the company performance, Millepied’s costume was designed by Berluti, and he collaborated with Rufus Wainright on the music for the special benefit performance. I mention that it must be challenging to manage “everything” for two different performing groups, plus fatherhood, I add—Millepied has a son named Aleph with his wife, Natalie Portman, who he met while choreographing the Aronofsky film Black Swan. And how is he holding up?